Even though we’re pretty close (relatively speaking), there’s still a lot that we don’t know about our next-door-neighbor, Mars. Today we often think of Mars as a cold desert-wasteland of craters, dunes, and lots and lots of rocks. 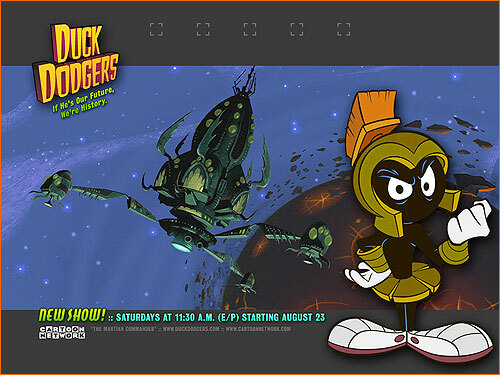 This is certainly how we’ve seen it in sci-fi of all kinds (like this one and this other one). But, as the authors of today’s paper show, there’s more going on for the surface of Mars than just Martian rocks. By performing laboratory experiments under Martian environmental conditions, today’s authors took steps towards understanding more about our dusty neighbor’s climate and related surface morphology. 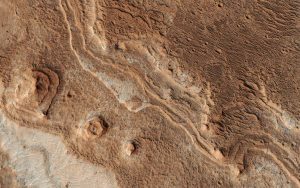 The authors used wind tunnel experiments to gain insight into how atmosphere-soil interactions occur on Mars. Wind tunnel experiments are quite aptly named; they consist of tunnels through which scientists blow air around solid objects (like airplanes), to learn more about things like pressure and velocity on and for the objects. The authors put Mars-like soil into their wind tunnel to study its wind-based transport, particularly through saltation. Saltation is a neat word that refers to when the wind makes a grain of soil ‘bounce’ on the surface: when the wind picks up a grain of soil, carries it away at a height a little bit above the soil bed, and then drops it again somewhere else. Previous research groups studying Martian saltation through wind tunnel experiments have tried to mimic Mars by using low-density materials under the Earth’s gravity, in the hopes of approximating the effect of reduced gravity on Mars relative to on Earth. But our authors today claim to be the first group to perform wind tunnel experiments on Martian saltation using both Martian atmospheric and gravitational conditions. Figure 2 displays a schematic of their wind tunnel experiment (the same setup that’s used for the ZERO-G Airbus, as operated by NOVESPACE). The authors simulated a Martian atmosphere by filling the outer vacuum chamber with a gas that contains 95% carbon dioxide and 5% air, and then setting the vacuum chamber to a pressure of 6 millibars. (For comparison, Earth’s atmospheric pressure is over 1000 millibars at sea level.) They also simulated Martian gravity using a centrifuge, which helped generate a centrifugal force of 0.38 g (where g is Earth’s surface gravity of about 9.8 meters per second squared, meaning that the gravity on the surface of Mars is about 3.7 meters per second squared). Figure 2: A schematic for the wind tunnel experiment. The soil was placed at the dust bed within the wind tunnel, which was contained within the outer vacuum chamber. The wind blew from left to right over the soil. 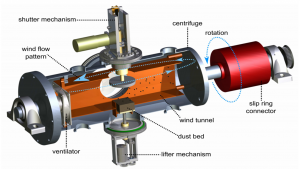 The centrifuge helped generate a centrifugal force of 0.38 g, while the shutter mechanism moved the shutter to protect and then resettle the soil during the setup of each experimental run. From Figure 1 in the paper. The authors used the JSC 1A Martian regolith simulant for their soil, which is a mixture designed specifically to simulate soil on Mars. The particles in this soil were really small; the dominating grain size of their soil was about 100 micrometers, or about the diameter of a human hair. This mixture sat on the dust bed of the schematic. At the start of each experimental run, the shutter closed over the dust bed, protecting the dust as the machine started its rotation towards achieving the centrifugal force of 0.38 g. Once achieved, the shutter opened and exposed the dust bed. The movement of the shutter disturbed the soil, causing it to lift and then settle back onto the bed; this motion was a key factor in the simulation, as it meant the soil for each run was resettled and prepared under the influence of the Martian environment itself. The authors blew the gas through the wind tunnel and over the dust bed using a fan, and they used a camera mounted sideways to the wind flow to track the movement of the larger particles in the soil. Each run lasted for about 20 seconds. Figure 3 shows an example snapshot of the movement within the tunnel. Figure 3: A snapshot during an experimental run, with the wind blowing from left to right, which shows the soil being lifted near the threshold wind velocity. The white bar corresponds to a scaled length of 5 millimeters. From Figure 3 in the paper. Using their camera footage, the authors calculated how the horizontal wind velocity varied with the height above the bed. One of the quantities they determined from their calculations was the fluid threshold shear velocity, which is essentially the lowest wind velocity needed to lift the grains. They found a threshold value in their simulated Martian environment of 0.82 meters per second. This threshold value is notably smaller than those reported by the previous wind tunnel experiments, so the authors pointed out the importance of the chosen environmental setup to run these sorts of experiments. The authors used this threshold value in computer-based atmospheric simulations known as general circulation models to simulate dust transport on Mars, and they found that their velocity threshold brings their models’ results into agreement with observations of Martian dust transport. Looking ahead, the authors point to a need for the laboratory experiments over longer time scales and over different levels of g, to explore how the results depend on time and gravity. With such broader experiments, we could further simulate – and thus better understand – interactions between the soil and atmosphere of Mars, and learn more about the complex climate and surface of our dusty neighbor as a whole. Snowmelt on Early Mars Could Mars have experienced a colossal global warming? Water in Gale Crater on Mars Why is Mars so small?